This tutorial will guide you to create MRTG graphs for your Linux/Unix Server or just about any network device which supports SNMP. This guide will present you the layout in a practical way and will not go in depth to explain the theories behind how they work. This is because the users will explore and learn them by themselves. It is an application layer protocol that helps the exchange of management information between network devices. It is based on TCP/IP and allows us to extract various information like network traffic and performance which in turn help us plan our network for growth and problems. First of all, you need the MRTG package. 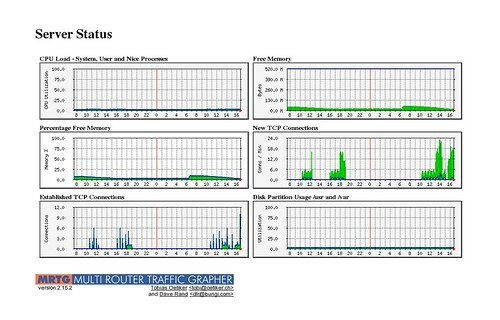 MRTG stands for Multi Router Traffic Grapher. It can be used to monitor and graphically display traffic and usage of an internet connection among many other things. In case, you are in a hurry, follow the steps below to install a very basic Apache web server. That’s it. Apache 2.2.6 should now be running! Moving on, we will next compile and install the MRTG package. (1.) Create local directory and change to that directory. (2.) Download MRTG. The latest version of MRTG as on 05-Dec-2007 is 2.15.2. (5.) Compile and install the MRTG software. (2.) Download the latest source package of net-snmp. The latest version of net-snmp as on 05-Dec-2007 is 5.2.4. If everything completes without any errors, that’s it. Net-SNMP is installed in your machine! Let us now create a snmpd.conf file which contains the basic elements for extracting information about your machine. (1.) Create the etc directory to hold your snmpd.conf file. # the “system” mib group in the mibII tree. #Disk size in Megabytes (MB). The most important data in any SNMP configuration is the community string which can be compared to a password. In the above snmpd.conf file, the rocommunity stands for read-only community string which has the value “MyPass333”. As with passwords, this has to be kept as as secret! (3.) Run the SNMP daemon using the above snmpd.conf file. (4.) Test to see if SNMP is working and functioning properly. Looks familiar doesn’t it? This is because we supplied the information in the snmpd.conf file! Assuming that you have did everything mentioned above correctly, then we will move on to generate a very simple graph showing the traffic status of your machine’s network interfaces. (1.) Create the directory to store your MRTG configuration (cfg) files. (2.) Create the directories to store your MRTG cfg files and it’s output files in your Apache DocumentRoot directory. Then, your DocumentRoot will be the default “/usr/local/httpd/htdocs/” directory. The above command will produce the output file “mrtg.cfg” and all graphs generated will be stored in the “workdir” directory. (4.) Finally run the mrtg tool to generate the graphs. (5.) Your graphs should now be generated. Fire up your web browser and enter the IP address or hostname of your machine. Note: Replace the IP above with the actual IP of your Linux machine. (5.) Generate your index.html file using the tool called indexmaker which comes with the MRTG package. Note: The above statement should be in a single line, i.e. no line breaks. There you have it. Your graphs will update every 5 minutes indicating the traffic flow in your eth0 network interface. Now that you have used cfgmaker to extract the traffic of the network interfaces of your Linux machine, it can be used on any network devices which support SNMP. Moving on, to explore more about SNMP and MRTG, we will create a new configuration file which will generate graphs showing the CPU load, Memory Usage, TCP connections and disk partitions of your Linux/Unix machine. The cfg file used for this task is taken from the site: http://www.linuxhomenetworking.com. This is a great site for all level of Linux/Unix users. Having said that, let’s move on.. (6.) Finally create a cron table entry to generate update these graphs every 5 minutes. That’s it. You have just created an effective method for monitoring your Linux/Unix box! Of course, MRTG is very versatile and can generate traffic graphs from your Squid proxy, Apache Web, Bind DNS, Qmail, routers, switches, just to mention a few. We will visit these topics in the coming days to come. Till then, enjoy monitoring your server with your newly generated MRTG graphs! This entry was posted in mrtg, snmp and tagged linux, mrtg, net-snmp, unix. Bookmark the permalink. Please put the following on the same LINE or in a single statement. I do that. But getting same problem. Thanx Tek dai mrtg is working now. Love the article, very well done and easy to follow. Only one minor tweak I would add to the system load – ssCpuRawWait.0 – it provides the IO Wait state which depending on the uses of the box could be quite high and would go undetected by your configuration. I have a DB server which based on your initial configuration seems almost idle because it’s an IO bound application. thanks Tek dai, i love all these articles. it is extremely nice. will you please provide creating policy routing and bgp configurations as like above articles?. I have read too many articles about policy routing but can’t understand. What a nice interesting article, keep up the good work! b) or your firewall is restricting you. Those are clean and neat step by step instructions, as a newbie can also setup such things.